I did this walk on Sunday 3rd February 2008. 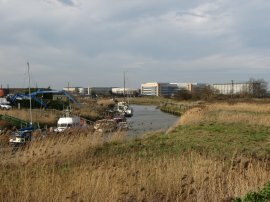 Earlier in the day I had walked the last stretch of the Thanet Coast Path between Ramsgate and Pegwell Bay and then continued walking down the A256 to Sandwich to resume my walk along the Stour Valley Walk. From where I had finished the last stage of the walk close to Sandwich Station, the route of the Stour Valley Walk continues along the old town walls, now named the Mill Wall. 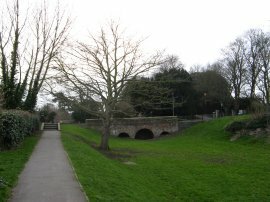 Crossing over Sandown Road, the route runs along The Bulwarks, photo 1, heading down to reach the Great Stour River by Sandwich Quay, photo 2. 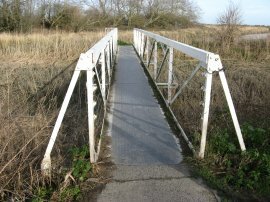 The path follows the course of the river, turning to the left to cross a white bridge, photo 3, and continuing to head down besides the Great Stour River. As I was crossing over the bridge I spotted a Kingfisher fly off along the bank of the river, the first one I had seen for about a year. Leaving Sandwich the route takes a tarmac footpath that's runs along the top of the flood bank following the Great Stour River, photo 4. Just past a boatyard on the opposite bank, photo 5, the route bears to the right away from the riverbank to head down towards a road. 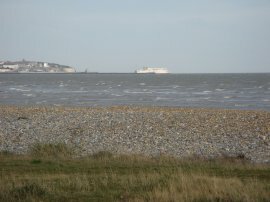 In the distance the premises of the vast Pfizer complex on the outskirts of Sandwich could be seen. 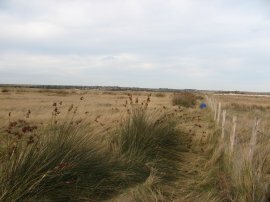 The route briefly joins the road and then takes a footpath that runs off to the right across an open grassy area from the apex of the bend in the road, photo 6. 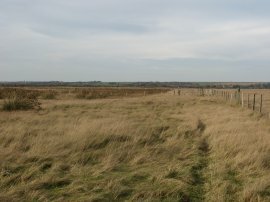 The route continues over the grassland and crosses over a stile to enter the grounds of the Prince's Golf Club, photo 7. 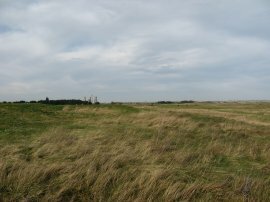 After making its way between the fairways the path joins a track that runs down to reach a narrow driveway beside the boarded up remains of the old golf club house, photo 8. 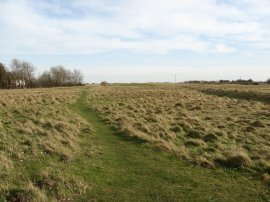 Here the route turns briefly right to leave the grounds of the golf course before turning left and left again to join a path that runs alongside the edge of the beach towards Pegwell Bay, photo 9. From the old club house it was 2.25 miles alongside the beach to the end of the walk. Looking over towards Ramsgate Harbour where I had started my walk earlier in the day I could see a ferry just setting out, photo 10, on what was probably going to be a very rough journey for the passengers on board. 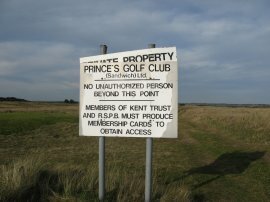 The path follows the edge of Princes Golf Club, a few yards from the top of the beach, for about a mile or so before reaching a sign that stated "no unauthorised person beyond this point", photo 11, although the sign did further state that members of the RSPB and Kent Wildlife could pass through if they had their membership cards on the them. 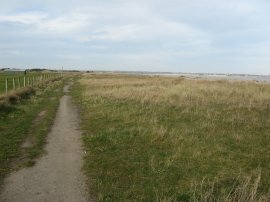 The alternative was to head down and actually walk along the beach, photo 12, which is what I did even though I did happen to have my RSPB membership card with me. 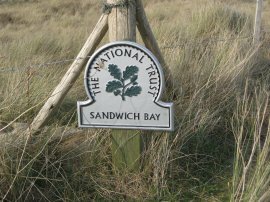 Reaching the National Trust's Sandwich Bay Nature Reserve the route of the Stour Valley Walk resumes it course running a few yards inland from the edge of the beach. 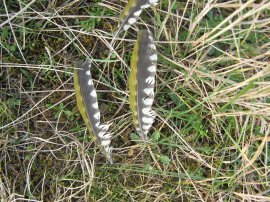 In the grass I spotted a number of colourful feathers, photo 14, although I have no idea what bird they came from, the feather were quite big, at least six inches long if not more. Leaving the reserve the route continues across grassy, and in places quite marshy ground, photo 15. 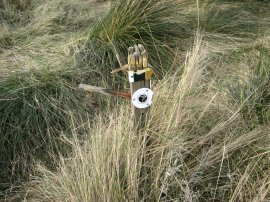 I had not seen any Stour Valley Walk markers since one by the entrance to the old boarded up golf club house some distance back until I passed one on a stile in the reserve which was reassuring to know I was on the right track. I headed along a rather overgrown and indistinct section of path running alongside a fence, photo 16, before the route passes one last Stour Valley Walk marker low down on a small post, photo 17. 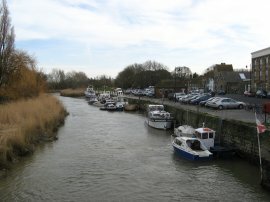 Here the route turned to the right then left again to head down towards the channel of the Great Stour River. 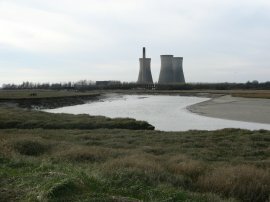 To my left where the towers of the Richborough Power Station which had been ever present for most of today's walk, photo 18. 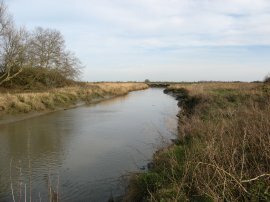 To the right a very short distance further down stream the Great Stour enters Pegwell Bay and I reached the end of the Stour Valley Walk, photo 19. 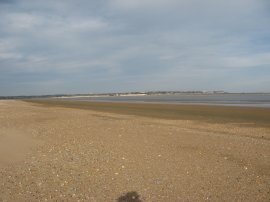 At this point I had walked 4.5 miles from Sandwich and from here there was no real alternative for me now but to retrace my steps back the same way. The end of the walk is in a very remote location and I wondered how many people actually make it to the very end of the walk by the Great Stour, the path across the last section of marsh did not seem that well used! As I had been walking here the strong wind had been behind my back but on the return journey it was once again blowing straight in my face. Reaching the end of the RSPB reserve I decided to walk back along the beach, the tide having exposed a strip of firm sand that was easier to walk along than the sometimes bumpy path along the top of the beach. 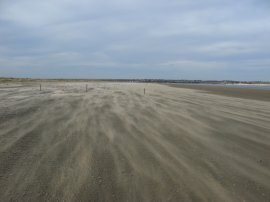 As I was walking along a thin layer of sand was being blown across the beach at a rapid pace by the wind, photo 20. From the still picture it is hard to gauge just how strong the wind was actually blowing although I did also take a short video which gives a much better indication, I just need to figure out how to reduce its size sufficiently to add to the site. Video now added! 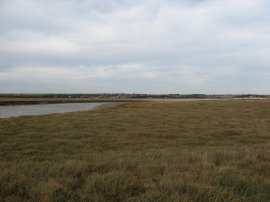 Pegwell Bay - Stour Valley Walk from Tim Bertuchi on Vimeo. 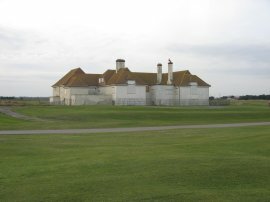 Heading back past the old clubhouse I continued along the coast for a short distance further to where the Saxon Shore Way cuts down to the sea across the Royal St Georges Golf Course where I turned right to start making my way over the golf course back to Sandwich. This meant I had now walked all away around this part of the coast, down as far as Hastings. With the walk I had done earlier in the day I had walked a total of 16.5 miles for the day by the time I got back to my car at Sandwich station. I had really had a good time walking along the Stour Valley Walk, I think it has probably been my favourite recreational path that I have walked in the South East of England. The scenery is varied, the path generally easy to follow with only a few boring road or urban sections and there was always plenty of interest to see. The total distance I walked along the path worked out at just over 55 miles.